The rat body size has shifted over time offers a glimpse into the habitat of the mysterious hominin Homo floresiensis—nicknamed the “Hobbit” due to its diminutive stature, a new study reports. The findings, based on an analysis of thousands of rodent bones, mainly fore- and hind-limbs, from an Indonesian cave where scientists discovered H. floresiensis in 2003, indicate that the local habitat was mostly open grasslands more than 100,000 years ago, but began shifting rapidly to a more closed environment 60,000 years ago. “Our paper is the first that we know of to use the leg bones of rats in this way to interpret ecological change through time, and it provides new evidence for the local environment during the time of Homo floresiensis,” says Elizabeth Grace Veatch, a PhD candidate at Emory University and a first author of the paper in the Journal of Human Evolution. H. floresiensis stood only about 3 feet 6 inches tall and lived about 190,000 to 50,000 years ago on the oceanic island of Flores in eastern Indonesia. The tiny hominin shared the island with animals that could have come from the pages of a Tolkien novel, including giant Komodo dragons, six-foot-tall storks, vultures with a six-foot wingspan, and pygmy Stegodons—herbivores that looked like small elephants with swooping, oversized tusks. The rats, however, most interested Veatch. Researchers based the study on remains recovered from the limestone cave known as Liang Bua, where scientists found partial skeletons of H. floresiensis, along with stone tools and the remains of animals—most of them rats. In fact, out of the 275,000 animal bones identified in the cave so far, 80 percent of them are from rodents. The study encompasses about 10,000 of the Liang Bua rat bones. 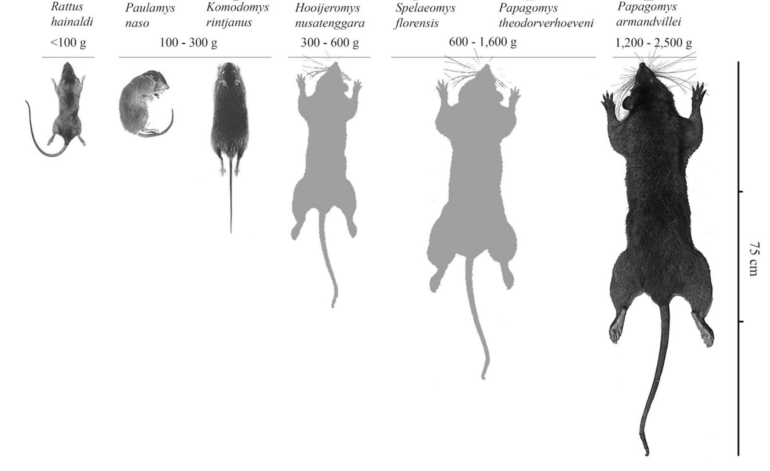 The remains spanned five species with distinct sizes, from the mouse-sized Rattus hainaldi up to the housecat-sized Papagomys armandvillei—commonly known as the Flores giant rat. After categorizing the bones, the researchers could then directly link them to both species and environmental types. Tracking the relative abundances of the different rat species over time indicated that the local ecology was mostly open grassland 100,000 years ago, transitioning to a more-closed, forested habitat around 60,000 years ago. That is around the same time that skeletal elements belonging to Homo floresiensis, the pygmy Stegodon, giant storks, vulture, and Komodo dragons disappear from Liang Bua. Many other questions remain regarding H. floresiensis, Veatch says, and the Liang Bua rat bones may help solve some of them. One key question is whether H. floresiensis hunted small game. Veatch is conducting field studies at the Liang Bua site, including running experiments to determine how difficult it would be to capture wild Flores rats. She is also doing research at the Pusat Penelitian Arkeologi Nasional (ARKENAS) Museum in the Indonesian capital of Jakarta which stores many of the bones from the cave site. She is analyzing a large sample of the bones to determine if any have cut marks—indicating butchering with tools—or pitted marks that would indicate owls or other raptors digested and deposited them in the cave. Coauthors are from ARKENAS and the University of Wollongong in Australia, the University of Bordeaux in France, and from the University of Adelaide in Australia.